I'm pretty sure I'm not speaking just for myself when I say re-reads awe awesome. Diving back into books whose stories you adore, and whose characters feel like friends. I'd even go so far as to say it's probably needed sometimes. When we're not in the best of moods, or are going through a tough time, reading books you know you love can help you feel a little better. I refer to re-reads as comfort reads, because, while lost in their pages, I feel all comfy and happy, and not much thinking is required, because I already know where the story will go. Hogwarts is one of my many happy places. I adore the Harry Potter books, I do, and occasionally, I will find myself craving a re-read, and the joy these books bring me. I'm reading them at the moment (hence why there hasn't been many reviews up for a while), and I'm really enjoying being immersed in this world again. However, this time round, I'm discovering elements to the stories that I'm really not liking. We all know about how J. K. Rowling has said how various characters are from certain marginalised groups (Dumbledore is gay, Dean Thomas is Black, Anthony Goldstein is Jewish, etc. ), without there being any mention of this is the books anywhere, and how representation is not representation unless explicitly stated. It is really pretty crappy of Rowling, and the more she she says "X is Y", the more angry with her I get. However, what I want to talk about today is about what Rowling actually put in the books. It's either not something I remember thinking about before, or even really noticing, but in this re-read, I'm noticing how many of the characters - specifically students at Hogwarts - who tease and bully others, and/or have a rivalry with Harry are ugly, bar Malfoy. It's not something Harry mentions out loud, but in his third person narration, when describing certain characters who aren't the nicest to him, he is pretty scathing about their appearance. Patsy Parkinson looks like a pug, Umbridge looks like a toad. There are a number of others who are described pretty appallingly, but I can't remember the exact descriptions now. I am someone who is really passionate about body positivity, and how society's impossible beauty standards have us putting ourselves down and judging others. This is something that has become more important to me over the last few years, and is probably why I'm noticing, now, all these terrible descriptions of people. It isn't necessary for all these characters to be ugly, nor for Harry to give an opinion on how they look. Their appearance doesn't make any difference; these characters would still be awful characters if Rowling described how they look without giving Harry an opinion. It's really mean and nasty, and sure, those Slytherins aren't great people, but the shaming for how they look is really bothering me this time round. Most other characters, whether people Harry really likes or people he is acquainted with, are described simply. Why do these characters have to be ugly? And then there's the fat shaming of Dudley and Uncle Vernon, and the constant referrences to Aunt Petunia's "horsey face". I just don't see why the people who are awful have to be unattractive, and shamed and judged for how they look. And speaking of Slytherins, how comes we don't see any Slytherin characters who aren't awful people? Yes, Slytherin has turned out more dark witch or wizards than any other house, but that doesn't mean every single Slytherin person will be a dark witch or wizard. I'm still in the middle of my re-read, so still have more books to read, but I don't recall a single Slytherin character who is nice, or at least not awful. According to Harry Potter Wiki, "Slytherins tend to be ambitious, shrewd, cunning, strong leaders, and achievement-oriented." None of these qualities, on their own, are negative qualities. Why do we not see a good Slytherin? And then there's Snape. How terrible he treated Harry has never really bothered me before. He was just the professor you love to hate. But this re-read, it's become pretty obvious to me that Snape is actually an abusive teacher. He has a vendetta against Harry, and will go out of his way to verbally abuse him and his family, trying to get a rise out of him so he can punish him. If this happened in real life, Social Services would be all over Snape. The way he treats Harry, and overlooks how others treat Harry, is outrageous, and I am finding it really difficult to understand why Dumbledore allows him to treat Harry this way. That's just what I've noticed so far, but I wouldn't be surprised if I end up having more problems with the books as I read on. I do love these books, and I'm sure I will continue to re-read them, but I do enjoy them immensely. But it seems the older I get, and the more educated I become, I'm going to start having real problems with books I love. I am finding myself shocked and appalled at what I'm reading this time round, and no doubt I'll find the same with other books I'll re-read. There's nothing wrong with having a problematic face, as long as you acknowledge and accept the books you love aren't perfect and have major failings. However, it would just be nice to have books I fall completely in love with who stand the test of time, and are without problematic failings. 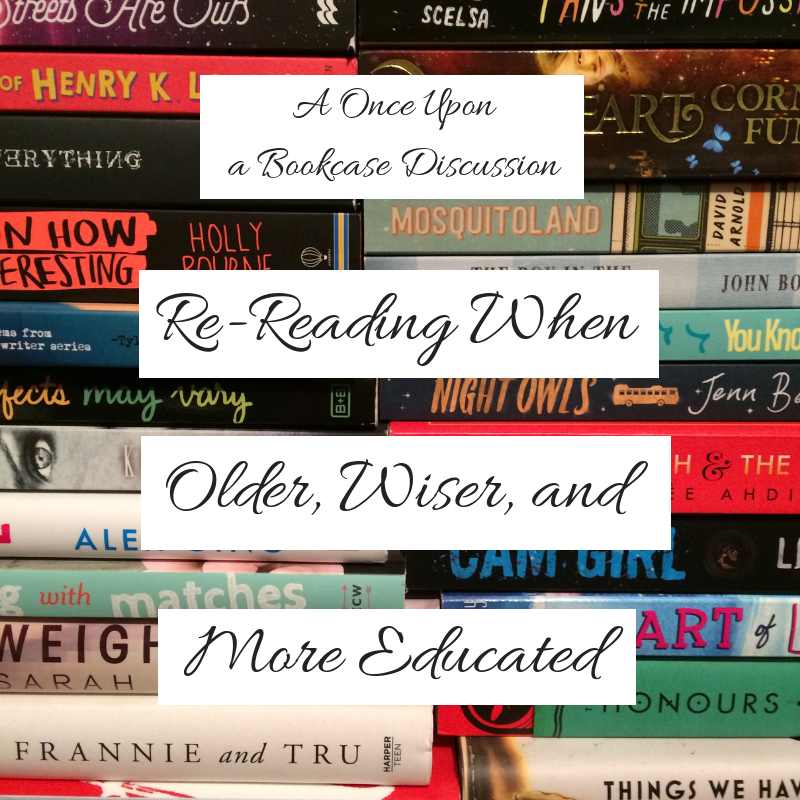 Have you ever re-read books you love at a later time, when you're older, wiser and more educated, and been appalled at what you're reading? How do you deal with discovering those books you love are problematic faves, and your feelings of shock and disappointment? Let me know in the comments! I rarely reread, but I have read the HP books more than once. I agree that there are issues we pick up on later that we might not have noticed the first time around. I've never noticed the comments about people's looks, though. Very interesting!